1) Wall:50mm Fiber Glass plate material withÂ intermediate heat insulation cotton. 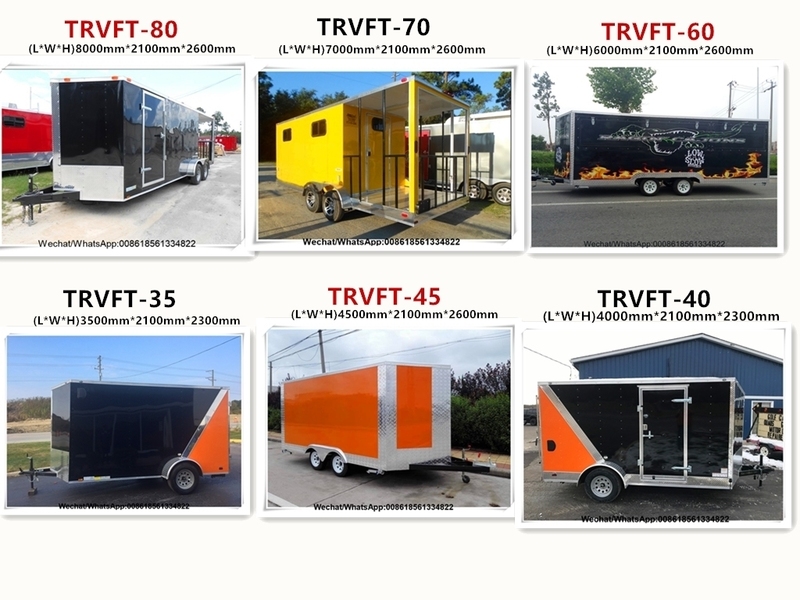 2) Chassis and Frame:Hot Dip Galvanized steel frame construction treated with rust resistant protective coating. 3) TowbarÂ with brake:Drawbar with safety ball headed coupling.Safety Electric Brake System+Hand Brake System. 4) Floor:Checked aluminum sheet or Australia standard vinylÂ floor,easy to be cleaned. 5) Power:LED light,cable socket switch circuit breaker based on global standard as neededÂ are all included. 6) Window and door:1 door on backÂ ,2 service window on side.1 window in front. 7) Working bench:food grade SUS 304 with sliding door undernearth. 8) Wheel:Two axlesÂ with 4*R14 wheels.Tires and high-speed bearings,5 leaves spring with high speed bearing.Max of loading is 4,400 pound. 9) Gas holder:1 piece/welded on towbar/stainless steel. 10) Water systems:Heavy-duty water system plumbing with automatic water pump, 220/110V high pressure water pump; on/off control switch; Double stainless steel sinks with faucet, cold and hot water, fresh water tank and waste water tank. 13) Character:Beauty Shapes,High Strengthen,Anti-Corrosion,Anti-dust,Fire-Resistance and so on.Suitable to be used in wet and high corrosive environment,smooth and easy to clean. 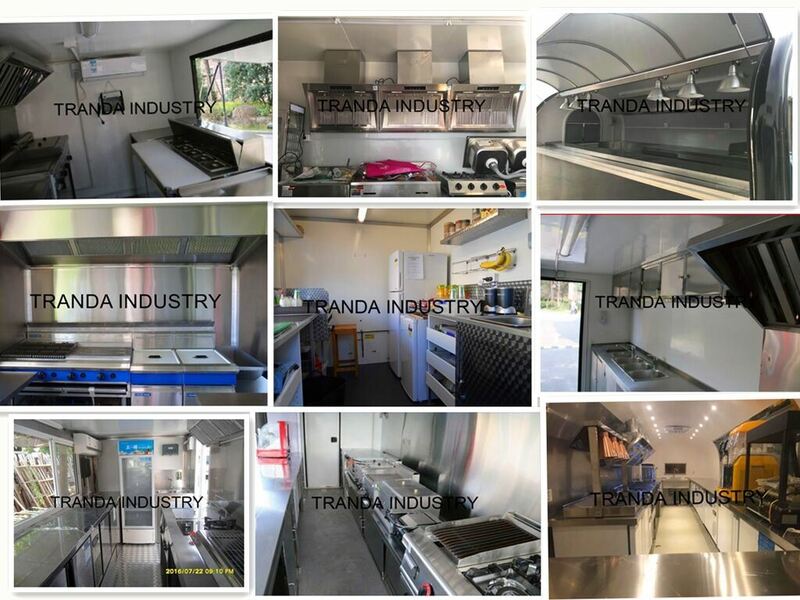 Heavy Duty deep fryers(gas/electricity), Storage shelves, Gas Burner, Waterproof external power socket, Ice cream display cabinet, Extended display table, Power distribution system, Cooler, Flat griddle(gas/electricity), Top open fridge/under counter freezer. 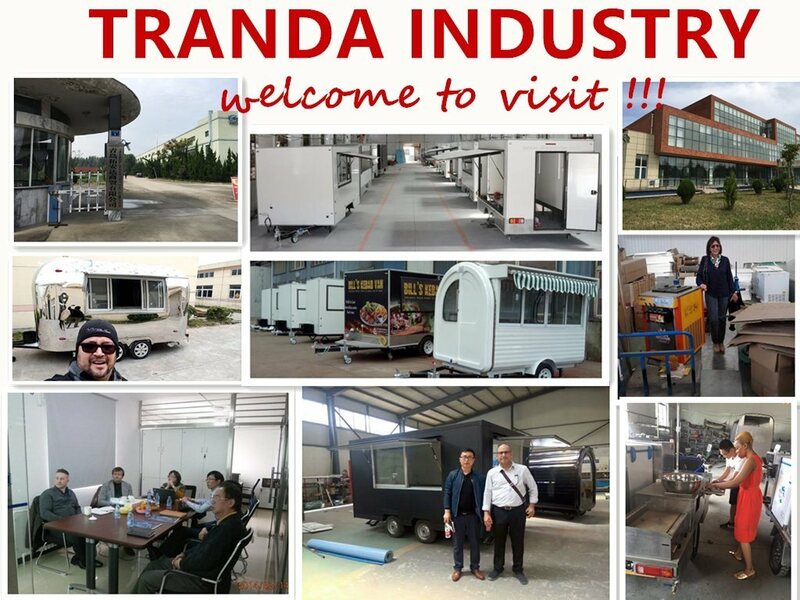 (110V/220V), Gasoline generator/Diesel digital generator, Hot dog Machine, Milk Shaker, Griddle Plate, Display Fridge, Coffee Making Machine, Crepe Maker, Ice Cream Maker, Salad Bar freezer, Food Warmer, Cash drawer, Juice Mahchine, Hot Water Boiler, Auto-egg mixer, Electric Oven, Bread Maker, Ice Maker, Cook hood, Air Conditioner...Special Requirement. 1) 6000*2100*2600MM, 2 axles, with braking system. 2) 4800*2100*2600MM, 2 axles, with braking system. 3) 4000*2100*2600MM, 2 axles, with braking system. 4) 3500*2100*2600MM, 1 axle, with braking system. 5) 2800*2100*2600MM, 1 axle, with braking system. Q: 1.Do you have CE or ISO9001 certificate? A: Yes ,we have both the CE certificate and ISO9001 certificate . Q: 2.What about the packaging ? Q: 3.Which country have you transport? 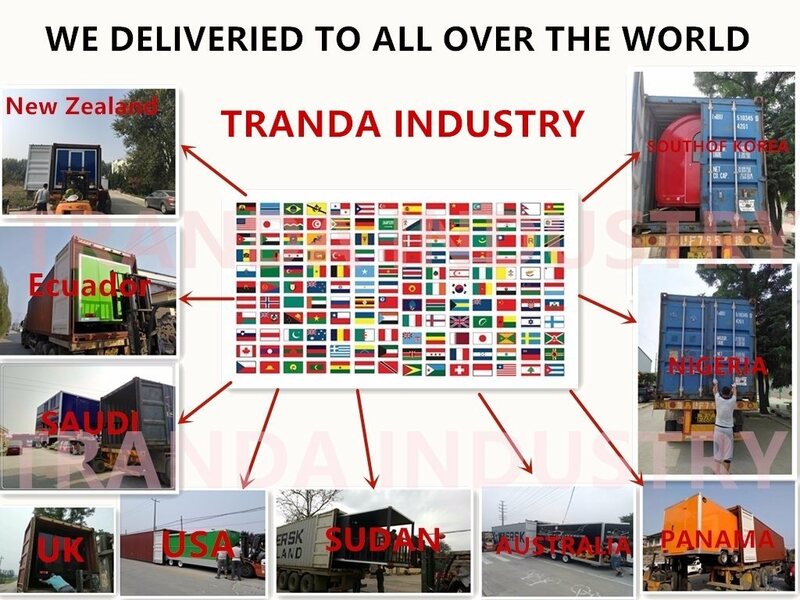 A: We have already exported to Australia, New Zealand, USA, Canada, Europe (Denmark, Netherlands, UK, Italy, France, Germany, Sweden, Spain etc), Middle East (Saudi Arabia, UAE, etc. ), and South America(Chile, Brazil, Peru, Argentina, Bolivia, Ecuador etc), etc. Q: 4.How can I get the latest price? A: You can send us inquiry, we can reply you within 24 hours, or Email us, or chat online for the latest price. Q: 5.I want 4 sinks on the food cart, is that possible? A: Yes. All the products can be customized. Q: 6.Will you please send me a quotation list of your products? 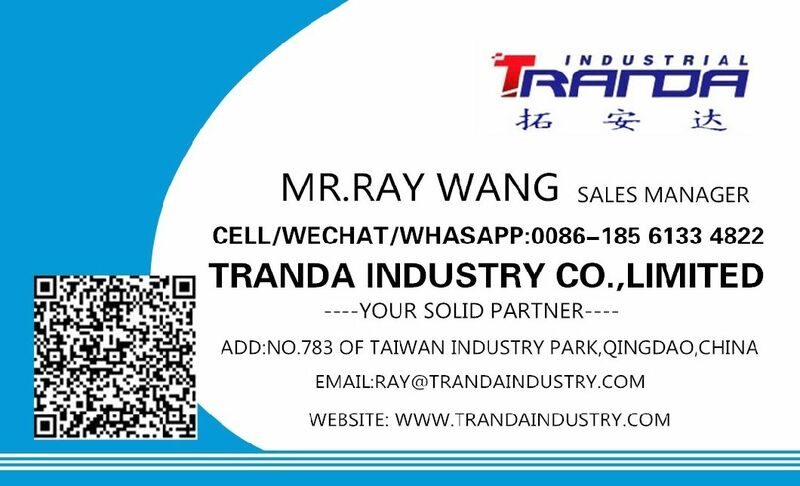 A: Thank you for your interesting, please leave your E-mail address or other contact information with your questions to our sales, they will get back to you soon.